Do bangs always end in a whimper in your house? Many dogs are scared of loud, unexpected noises, which makes firework season a particularly traumatic time for them. If your dog is among the countless pets who become anxious or afraid while the celebrations are in full swing, Edgewood Veterinary Group has created an infographic to help you help them. Along with those tips, one of the most effective ways to keep your dog calm is to use pheromones, which our head nurse, Jessica, will be happy to advise on when you contact us. Make sure your dog gets plenty of exercise during the day when you know fireworks are likely in the evening. Keep your dog inside during fireworks with human companionship. 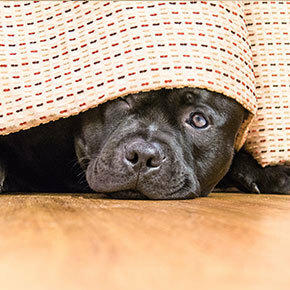 Provide a safe place for them – when scared of loud noises, dogs often like small, enclosed areas. Give them something fun to keep them occupied. Make sure they are microchipped, as some dogs may try to escape. Hopefully these suggestions will help you and your pets enjoy a calmer firework season, and remember, for advice on pheromones feel free to contact us.